The suberb Keyboard Maestro offers great possibilities to extend The Archive. Use case: Wouldn't it be nice to insert a link to another Zettel into The Archive by simply selecting it from a list. Think of this as a sort of omnibar-functionality for inserting Zettel links. 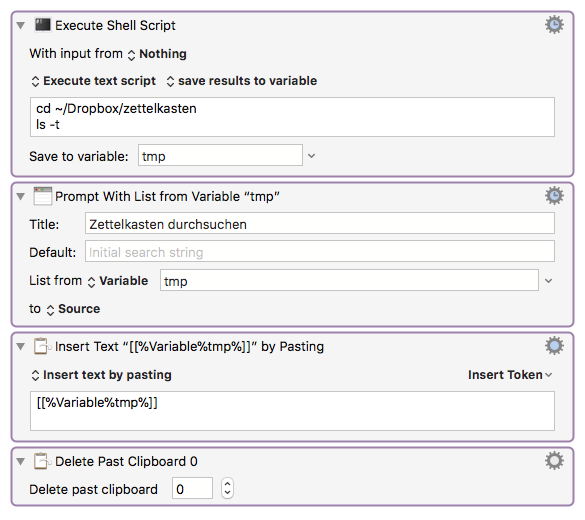 The first action saves the current list of all file names in your Zettelkasten to a variable. Of course you should change the path in the action to match your archive location (surround the path with "if it contains spaces, e.g. "/path to/my zettelkasten folder"
Keyboard Maestro users can download the macro file for easy import into their macro library. Summary: The Archive and Keyboard Maestro: a match made in heaven. I also updated the linked macro file to this version. Thanks for the quick fix. It works like a charm on my machine as well. Thanks for sharing! That is amazing. Thanks for sharing and I look forward to lots of amazing KM macros! I didn't like the file extensions being shown in the file list, so I modified the macro to first strip the file extensions before showing the list (using a "for each line in variable" block). With my 230 notes, this however results in a delay of about two seconds before the list window is shown, which is slightly irritating. Now I am trying to figure out whether I want to try to create a better performing version of the macro, or whether I should just learn to love the file extensions. Anyway, thanks again for a very useful macro! I've now figured out a much faster way to get a file list without file extensions: Simply replace ls -t in the original macro with ls -t | sed -e 's/.txt//'. 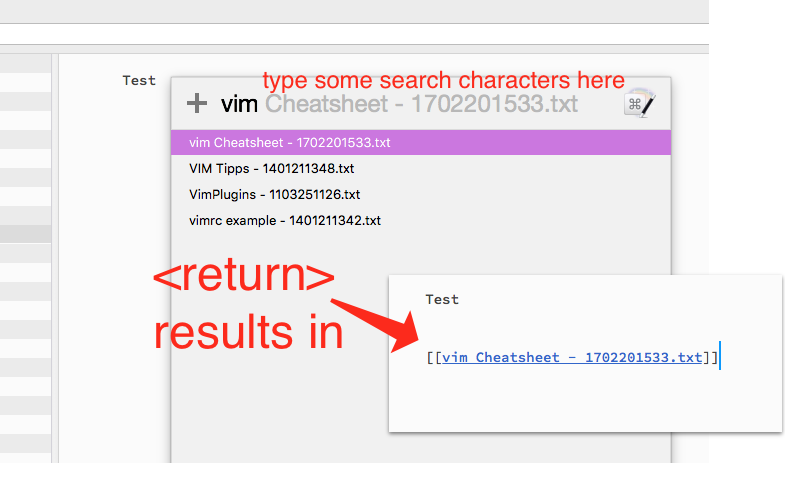 Then you can also delete the "Search and Replace Variable" action. Thanks @Basil for the improved version, it's working like a charm and @kaidoh for the original script. Very useful. thanks for improving on the macro. You're right, the command line is faster than Keyboard Maestros implementation on almost every occasion. The downside: it is almost ever a lot harder to figure out the right commands and arguments. I changed the original macro to include Basil's idea. Download it here. Great work! We'll totally post this on the blog. Thanks, @kaidoh for work on these scripts and the intro to Keyboard Maestro. The list I get using Terminal is sorted differently for the list populated to tmp in KM. Is there an easy way to have just the Zettel-ID part copied in the note after choosing one in the search window instead of the whole note title, so [] instead of [[201901212335 Example Note]]? I always link to other notes just using the Zettel-ID in brackets. @Vinho YES! This is the Keyboard Maestro macro that I use for just this purpose. Easy peasy! Download, import, change the directory and when creating a note just type [[ and typeahead search for the link, hit enter and continue. A link of the type [] will be inserted. This is not all my creation. Credit to @kaidoh for the kernel that inspired this and to @sfast for his insistence that links just be a UID so the titles are free to change without a loss in connectivity. That's great Will, works perfectly! And suddenly I enjoy using The Archive soooo much more! !